We’d love your help. Let us know what’s wrong with this preview of The Power of Different by Gail Saltz. In The Power of Different, psychiatrist and bestselling author Gail Saltz examines the latest scientific discoveries, profiles famous geniuse A powerful and inspiring examination of the connection between the potential for great talent and conditions commonly thought to be “disabilities,” revealing how the source of our struggles can be the origin of our greatest strengths. In The Power of Different, psychiatrist and bestselling author Gail Saltz examines the latest scientific discoveries, profiles famous geniuses who have been diagnosed with all manner of brain “problems”―including learning disabilities, ADD, anxiety, Depression, Bipolar disorder, schizophrenia, and Autism―and tells the stories of lay individuals to demonstrate how specific deficits in certain areas of the brain are directly associated with the potential for great talent. Saltz shows how the very conditions that cause people to experience difficulty at school, in social situations, at home, or at work, are inextricably bound to creative, disciplinary, artistic, empathetic, and cognitive abilities. To ask other readers questions about The Power of Different, please sign up. Education Pioneer - Diversity, equity and inclusion in education. I won this ARC in a Goodreads giveaway. I know it took a while to finish, but well worth it. Gail Saltz has set out to redefine the stigmas associated with what has been called mental disorders/disabilities, terms she tried to move from by calling them 'brain differences.' Everyone is different, she argues, and as such everybody's brains will be different too--in how they process information, the output that results, how they function within school and work (and society as a whole). She emphasize I won this ARC in a Goodreads giveaway. I know it took a while to finish, but well worth it. Gail Saltz has set out to redefine the stigmas associated with what has been called mental disorders/disabilities, terms she tried to move from by calling them 'brain differences.' Everyone is different, she argues, and as such everybody's brains will be different too--in how they process information, the output that results, how they function within school and work (and society as a whole). She emphasizes the importance of shaping education to fit students' learning needs and refraining from holding them to a standard that works against them and their attempts at success in a standardized, conformist society. She also highlights the importance in finding positives that come from brain differences--such as someone with a dyslexic type disorder better able to visually absorb information, thus making them better at pattern/difference recognition. 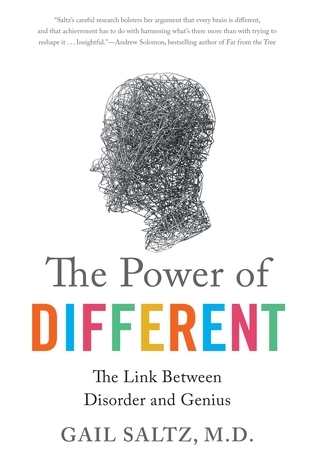 The overall message in The Power of Different is to recognize that individuals with brain differences are just as equally able to contribute and succeed in society, despite our society's desire to hold them to standards they will never be able to meet with how their brains operate. The education in place does not currently accommodate those with brain differences, not does society hold welcoming arms to these people, and these are changes that need to happen. Aside from the important message, I am greatly impressed with how easy The Power of Difference is to read. I found myself reading slowly because it was very interesting and thought-provoking, but I also found myself able to understand the research/studies she cited and explained; the medical/scientific explications throughout were extremely accessible, which I always appreciate. From a personal perspective, I found myself identifying with some of the descriptions in the Distractibility chapter and with all identifiers in the Anxiety chapter (the former a surprise, the latter a known my entire life). I will say that this book would not be good for a hypochondriac to read, because I could see self-diagnosis in their future. (That wouldn't be good for anyone, and diagnosis is always best left to the professionals.) However, I can see how this would be a great book for a parent of a brain difference child to read--it would be comforting to me if I was struggling to help my child fit in and succeed. If you are interested in studies of the mind and combating mental disability/illness stigmas, this books would be a good pick for you. However, it is also possible that certain chapters would work best if you already have information regarding your own brain difference. I truly loved this book. As a mother of 2 daughters on the Autism Spectrum I was particularly interested in the last chapter which dealt specifically with this. The quotes from adults on the spectrum who talked about things from their perspective, what they felt, what they were thinking, etc because so many times I would nearly jump from excitement upon finding something that seemed to explain more fully what my children are currently going through. The information in this book is extraordinary I truly loved this book. As a mother of 2 daughters on the Autism Spectrum I was particularly interested in the last chapter which dealt specifically with this. The quotes from adults on the spectrum who talked about things from their perspective, what they felt, what they were thinking, etc because so many times I would nearly jump from excitement upon finding something that seemed to explain more fully what my children are currently going through. The information in this book is extraordinary and life changing. The connection between intellectual brightness and social/behavioral difficulty was very enlightening as that is a problem I’m currently having with my 7 yr old who is showing an affinity for science and math. Due to her social skills not being on par with others her age we’ve had quite a bit of difficulty in getting people to take her interests and intelligence seriously. The sentence, “…they failed to see that their labeling of Ethan had also become limiting” could be the mantra for so many children like mine. This book should be required reading for every caregiver, educator, doctor, etc who has anything to do with someone who has a special gift. It’s long been believed that creativity and high intelligence has a high correlation with elements of mental illness but it’s more than possible what one believes is an illness is just a misunderstood gift, this book rips apart those lines and belief systems. Gail Saltz is my new hero. She has written a book that will change how we view so many things and thankfully she wrote it in a way that makes the topics interesting and easy to read. I could not put this down, I even had to go back and reread sections to make notes so I could share what I’ve learned with my husband. This is an important book. I received an advanced copy, and I hope that after it's published in March it permeates many fields, for its information is vital to so many of us: parents, teachers, counselors and psychologists, doctors, therapists, employers, anyone struggling with mental and/or emotional conditions, really - all members of our diverse society should be exposed to this information. The Power of Different is set up in chapters that examine Learning Differences (Dyslexia); Distractibil This is an important book. I received an advanced copy, and I hope that after it's published in March it permeates many fields, for its information is vital to so many of us: parents, teachers, counselors and psychologists, doctors, therapists, employers, anyone struggling with mental and/or emotional conditions, really - all members of our diverse society should be exposed to this information. The Power of Different is set up in chapters that examine Learning Differences (Dyslexia); Distractibility (ADD, ADHD, and others); Anxiety (Generalized Anxiety Disorder, Obsessive-Compulsive Personality Disorder, Panic Disorder, and Phobias); Melancholy (Depression, Dysthymia, and Dysphoria); Cycling Mood (Bipolar Disorder); Divergent Thinking (Schizoid Personality Disorder, Schizophrenia, and Schizoaffective Disorder); and Relatedness (Autism Spectrum Disorders). Dr. Saltz prefers to address such conditions as "brain differences," and she explains the neurological and personal experience of each one so we can understand what they are actually like. This takes away much of the stigma associated with mental illness. Saltz goes much further, though! She illustrates the ways individuals struggle with each condition, but also presents the particular strengths that are associated with each and how they can be used to successful advantage if the illness is mitigated. She tells which kinds of strategic help (medical versus behavioral therapy) are most likely to control the overbearing aspects of given conditions, and we learn that the majority of conditions have much room for hope, particularly if diagnosed early. My take-away: Get past the social stigma and obtain and accept a diagnosis for yourself or your child. Don't panic, but search out the creative approaches to help that are available. When the overpowering symptoms are mitigated, there are accompanying strengths that can be pursued to lead to very satisfying, and even remarkable, success. We need to be more aware of how stifling our current educational system is to many of our children and create ways to play to the strengths more. In particular, when working with young people that have brain differences, it is important to keep the ratio of working on weaknesses for only 20% of the time, with 80% of working time being spent on strengths. For several reasons conjectured and unknown, a greatly increased capacity for creativity accompanies these conditions, which points to the need for unstructured time, as well. Coming from the viewpoint of a lay person with a non-medical/teaching/counseling graduate degree, I give this book four stars (wishing we could go to the 4.5). Its contents are invaluable, and I hope it sees much use as a text in a wide variety of fields. Wouldn't it be great if Saltz could now produce enlarged volumes for each chapter's focus that could offer even more extensive information? I would especially love to see a version produced that is less academic in tone, which would be more accessible to many parents and younger people (although the form this is presented in provides validity). This is an empowering and insightful book for sure, and it really hit home! All teachers should read it. I would recommend this to anyone and everyone because we all know someone who's brain works differently. First things first, I'm in my 20's, I have a well-paying job in a media and tech industry for a company that is a leading social entertainment publisher ranked among the top 20 websites in the world. I am a Quality Assurance Specialist at this company. One of my disabilities (OCD) is a key This is an empowering and insightful book for sure, and it really hit home! All teachers should read it. I would recommend this to anyone and everyone because we all know someone who's brain works differently. First things first, I'm in my 20's, I have a well-paying job in a media and tech industry for a company that is a leading social entertainment publisher ranked among the top 20 websites in the world. I am a Quality Assurance Specialist at this company. One of my disabilities (OCD) is a key contributor to what makes me spectacular in my role of testing our products and software, designing test plans and cases, spotting bugs and issues, and logging detailed bug tickets for developers. Despite being "different," I try to conquer obstacles in my daily life and work my hardest every day. When I do succeed at something, I appreciate it so much more because I know how hard it was to get there. From first-hand experience, I understand the discomfort of requiring extra time to take tests, taking math classes in a different room with only a few other students, and the embarrassment of being told to read out loud when you couldn't verbally comprehend the text without sounding like a robot breaking down. I had a tough time in school, and it has been a discouragement all of my life. I've struggled with reading comprehension, math skills, open-ended test questions, and problems, reading out loud, responding to questions out loud and needing time to work it out in my head, and absorbing basic lessons. I will not get into too many details about how it all made me feel, but there were so many times when I felt like I was a failure or not smart enough. As explained (and this part hit home) my brain works differently, and it made me feel "stupid." This book was inspiring, and I wish the knowledge was around when I was young and that this cause was opened up about more. All through school, I was told I had a learning disability. I wished I could comprehend and tackle problems easier; I wished that other students didn't degrade or judge you based on it; I wished people didn't look at you or talk about you like you were different and didn't fit in. I was embarrassed by being taken out of my regular class when there was a test, to take the test in another room to get more time. It was humiliating when kids would say "It's not fair that you got extra time on that test" or hearing snarky comments that made me feel inadequate. One of the biggest reasons I feel this book is an important read is just that. Teachers, parents, and students need to understand what disabilities are, how they can help, how they can encourage the student and help them stop doubting themselves. Very importantly, they need to teach their children to be kind and know that everyone learns differently. Many people will never understand the obstacles, the difficulties, and the hardship to work so hard on oneself: to study that much longer, to need more time to comprehend the work, to be frustrated because everyone figured it out and you still don't get it, and to think you are not good enough or smart enough for something. We live in a world where there are highly intelligent confident people who will always have a response first, who will know what to exactly say, who will know the answer to a question given in a group; it will be so obvious that this is a person companies would fight over having. Then there is the selection of us who freeze on the spot and just don't know the answer, will be discouraged, and have a hard time selling their potential. I will tell you one thing, regardless of practice, interviews are a weakness, but I will work my damn hardest wherever I go because I've known struggle. ‣ I hope that more parents teach their children to be kind to other children who are struggling and not consider it unfair if another child requires something different. For parents who have a child who has a learning disability or difficulty in school, teach them that they are smart enough and help push them towards greatness! ‣ I hope that those whose brains do work differently know that they are not any less intelligent than others and that where they may have their weaknesses, there is something they will strive at and be great at. You are not stupid, work hard, and you will probably come out feeling more proud of yourself in the end than someone who found the task easy. It will be worth it! ‣ I hope that more teachers acknowledge students who struggle and figure out how to work with them and how to talk to them. I hope they can observe the children they teach and not assume that a child is lazy and not worth their effort. It is their job not to give up on that child and to help her or him reach their potential. I hope all children motivate you to figure out ways to teach them and give each the appropriate attention he or she need! On the positive side, I learned a lot about various brain disorders. I thought that aspect of the topic was covered well with good examples and quotes from people who have the disorders and have learned to cope and even excel. Another big plus is the emphasis on how we all can better relate to others who have brain disorders. One example is "people first" where we say and see "a person with dyslexia" rather than a "dyslexic." The latter actually calls the person by the name of the disorder. That On the positive side, I learned a lot about various brain disorders. I thought that aspect of the topic was covered well with good examples and quotes from people who have the disorders and have learned to cope and even excel. Another big plus is the emphasis on how we all can better relate to others who have brain disorders. One example is "people first" where we say and see "a person with dyslexia" rather than a "dyslexic." The latter actually calls the person by the name of the disorder. That in itself was a great take-away for me. A beautiful read on why I love working with the mentally ill- because they have different brain structures that produce such excellent insights. Thank you, Dr. Saltz, for believing in the power of your patients just as much as I believe in mine! People having various neurological or psychiatric disorders frequently enrich society by virtue of having a distinctly different perspective on life due to nature's allotments. In The Power of Different, Dr. Gail Saltz lays out various case studies in which altered abilities in some mental functions give way to enhanced abilities in others. Saltz makes a successful bid to sensitize her readers to the complexity of human thought and capability. She also demonstrates the potential costs incurred b People having various neurological or psychiatric disorders frequently enrich society by virtue of having a distinctly different perspective on life due to nature's allotments. In The Power of Different, Dr. Gail Saltz lays out various case studies in which altered abilities in some mental functions give way to enhanced abilities in others. Saltz makes a successful bid to sensitize her readers to the complexity of human thought and capability. She also demonstrates the potential costs incurred by society if it is dismissive of people whose cognitive abilities or tendencies lay away from the 'norm'. The Power of Different could not appear more timely in America for the waning of social sophistication and compassion in our present-day government. "Mental illness" as a technical label has little more value than "somatic / bodily illness" for the purposes of description and classification. Yet we see it used exclusively time and again. Saltz rectifies this deficiency by presenting a clearer description of several forms - dyslexia, ADD, anxiety disorders, depression, bipolar disorder, schizophrenia, and autism (she categorizes them in a more sophisticated manner that also includes more disorders than I refer to here). She allocates a chapter for each disorder, making it concise and readable to anyone. She also points out that disorders can and do overlap as would be expected for a networked bodily organ. Her chapters are grouped by symptomatology. She also makes the key point that psychiatric counseling is about the treatment of symptoms - classifying conditions is done for insurance purposes rather than treament purposes. Within each chapter, Saltz explores creative potentials that can be enhanced by the condition(s) described. She also stimulates productive thought as she discusses "work arounds". She proposes behavioral changes that people, or their associates, can make to cope with differences in abilities and thus enhance the strengths which people possess as a result of these differences. The book does walk a fine and contentious line on the topic of semantics. What does one call a medical condition that comes about by an aberrant developmental condition and/or genetics and which directly impacts cognitive function? What social repercussions do labels have? The book occasionally comes across as muddled regarding these questions - muddled for its realism primarily but not exclusively. For example, she refers to dyslexia as a 'difference' as opposed to a disorder. Referring to a condition simply as a 'difference' puts it at risk for lowered medical research and might jeopardize insurance coverage. Saltz discusses dyslexia as a 'learning difference' and she gives the reader a lucid description of how someone with the condition is predisposed to think when reading. But she also tells of some people describing their experience as seeing letters "moving or vibrating on a page." Vibrating letters are a perceptual pathology not simply a difference. Dyslexia frequently afflicts a person concurrently (i.e. comorbidly) with other difficulties, such as dyspraxia which she explains is a difficulty in articulating sounds due to a kind of neuromuscular impairment. "I have interviewed multiple successful and supremely creative individuals with brain differences for this book, and in each case I have asked them if, given the choice, they would eliminate their brain difference. To a person - and no matter how much pain their difference has caused them - they said that they would not. Each of my interviewees couldn't imagine separating their strengths from their weaknesses." This kind of sampling is far from interviewing a person with a condition at random. She does not refer to people who lack supreme creativity. Therefore, using the term "brain differences", as opposed to "disabilities" or "disorders" runs a danger of overcompensating for historically negative views of some people. She points out her focus on exceptional people repeatedly. However, when a reader fails to attend to her disclaimers, they might lose sight of the possibility that not-so-creative persons might find themselves in misery. The fact that her interviewees would retain their conditions could reflect their status as exceptional people more than their status as people with a recognized medical issue. Nevertheless, Saltz carefully avoids romanticizing any condition. As I said, she gives an *appropriately* biased picture, as one of her intentions is to highlight potential within people having a wide diversity of cognitive abilities. In America, at least, her agenda is imperative. I have my own biases as I write this critique. I have temporal lobe epilepsy. The history of the disease includes a pendulous swing in status within the psychiatric community, and this volatile status can have high costs for the patient. Decades ago, epilepsy was front and center among mental illnesses. The illness was oddly both comorbid with and caused by seizures. When anticonvulsant drugs became highly effective at reducing or eliminating outward seizures, the disease mysteriously became non-mental. Yet, I can pick out various mental symptoms from multiple disorders that Saltz describes and show them to also be comorbid with temporal lobe epilepsy. Saltz quotes a young woman with dyslexia, "I do better with abstract concepts and ideas as opposed to solid things that require huge amounts of knowledge stored." I have expressed exactly the same thoughts about epilepsy (in an earlier published work) as the woman quoted. I also appreciate points that Saltz makes regarding attentional difficulties and creativity. Saltz emphasizes the power of disinhibited thoughts - the amnesia with which I am too familiar has similar powers (when you cynically assume that you'll be wrong most of the time, you cannot be bothered to intellectually police yourself). Epileptic activity can gyrate a person's focus. Paradoxically, it can make a person hyperfocused as well. Epilepsy, however, is very pathological, frequently melodramatic, and even if it did bring me great success and creativity, I would never pause a moment to be rid of it. But then again, I am not supremely creative either. Psychiatrists could be routinely treating epilepsy symptoms - as Saltz points out, treating symptoms is what psychiatrists are here to do. Unfortunately, treating the psychiatric symptoms by doctors and receiving reasonable accomodation in the work place has been greatly complicated by the "purging" of the mental illness out of the disease. Today, sufferers are too often perceived as being in a 100% normal mental state when not seizing. That misperception creates social problems. Semantics matter greatly, and the reader needs to critically examine any comment which suggests that a change in terminology is being made for any reason other than a coldly biological one. Such a comment may be very wise, but it needs introspection before quick acceptance. Having a mental disorder can incur stigmatization, but falsely not having one precludes the best care. For that reason, my own attitude is to work to purge the stigma from terms like "disability" or "mental illness" rather than change or discard the terms themselves. Despite our disagreement, Saltz's highlighting of the refinements of other abilities, brought about because of disorders, benefits people with either viewpoint. A person optimally focused on abstract thoughts can make great contributions to an intellectual endeavor, just as Saltz points out. Saltz tackles supremely complicated issues, facilitating finding bones of contention. However, what Saltz accomplishes with her writing overshadows the points of contention that I raise. Of numerous accomplishments, she a) humanizes mental challenges in a systematic and comprehensive manner; b) provides a text-book knowledgebase that fosters empathy as it informs; and c) poignantly lays in evidence what society stands to lose when we become insensitive to the human potential in anyone. I picked up this book with no expectations. I read the full synopsis and it sounded like an interesting read. I have always been interested in knowing the different ways in which people think and function. It is nice to read a book that looks at a disorder and sees where the positive is and how to use it for every day life. Saltz takes away some of the stigma. I would recommend this book to everyone as it helps us understand those around us. Disclaimer: This book was a Goodreads giveaway prize. Fascinating insight. We can all hope that through knowledge and understanding, the stigmatized barriers surrounding brain differences can be torn down. I was especially appreciative that this book was written in a way that made it very easy to understand. I really enjoyed this book. It gave me a better insight on different mental disorders and how I can better support children and adults through their struggles. I recommend it for anyone who has an interest in genius, creativity, or mental disorders. This book was so inspiring and reassuring as a mother of a child with ADHD and ASD. It put into words so many things I've felt but been unable to articulate. I am grateful for the examples and inspiration the stories she shared offered. And just grateful to hear from others who have walked a similar path and who have found purpose, meaning and fulfillment. I reviewed this title on my blog. After hearing several podcast interviews with the author, I wasn't able to resist buying the book. I love the idea of bringing attention to the positive aspects of mental disorders, both to give hope to those afflicted and to enable them and society to harness strengths that might otherwise go unnoticed. Unfortunately, the book felt more like a collection of anecdotes and examples of brilliant people who became successful despite having a mental disorder rather than a presentation of the upside After hearing several podcast interviews with the author, I wasn't able to resist buying the book. I love the idea of bringing attention to the positive aspects of mental disorders, both to give hope to those afflicted and to enable them and society to harness strengths that might otherwise go unnoticed. Unfortunately, the book felt more like a collection of anecdotes and examples of brilliant people who became successful despite having a mental disorder rather than a presentation of the upside of those brain differences. Personally, I would have preferred more science on potential benefits of the specific disorders and less focus on afflicted yet successful individuals. While the topic was quite interesting, I don't really feel that the author made the link between being "different" and being genius. As another reviewer said, Simply the "Power of Different" would have been enough. This is a Goodreads win review. This is an excellent book about disabilities, disorders, and mental illnessess. But dispite these some people flourish and have great talent and creativity. First: Baaah ha ha ha ha ha ahhhhh ha ha ha ha haha. Second: If you are easily offended or into anything p.c., don't read this review. This was an easy, fun read. I loved it for what it was attempting and for its sheer, delightful ridiculousness. Would have been a fun one page theory. And there is a grain of something interesting there. Which is: Humans have long known that insanity and genius are linked. We don't need any researchers to tell us that, we have known and been pondering this since an First: Baaah ha ha ha ha ha ahhhhh ha ha ha ha haha. This was an easy, fun read. I loved it for what it was attempting and for its sheer, delightful ridiculousness. Would have been a fun one page theory. And there is a grain of something interesting there. Which is: Humans have long known that insanity and genius are linked. We don't need any researchers to tell us that, we have known and been pondering this since antiquity. And despite our impressive new words surrounding the subject, we are no closer to answering the question than Plato was. Saltz thinks that the "brain differences" in "neuro-atypical brains" that affect FIFTY PERCENT of the population (you see the humor?) all come with special strengths, that's why they have evolved to exist in the human species. If these brain "differences" (I laugh every time I type that) didn't serve human survival in some way, they wouldn't exist by now. Note that these people with different brains just had certain personality traits until school became widespread and compulsory. The ADD brain that can't settle down to learn what the teacher wants it to learn but absolutely can learn anything it feels passionate about, that brain was just fine to have ... until school. It is the box that is school that makes half the population have "successful" brains and the other half have such "abnormal" brains that they need to be medicated to deal with it. ADD makes you less able to focus on what bores you, but better able to focus (passionately) on what doesn't bore you. It makes you the "absent minded professor." A "genius" at what you love and a little spacey about everything else. People with anxiety have all these little voices in their brain that drive them nuts, and they spend half their time just wanting them to shut up so they have some peace... But at the same time all those extra voices offer a lot of extra information that other people don't get to have. Anxious people perceive more than "normal" people. If you shut up the voices, you lose your edge. And the sad, melancholy types? They empathize better than people, which is another form of heightened perception. They have mood swings and days when they have to drag themselves out of bed, but when they are out of bed their creative output is higher than that of "normal" people. Despite that Saltz sets out to show that the people with "different" brains have super powers that people with normal brains envy, that no genius ever changed the world without learning first how to deal with his special brain, she is endlessly pushing meds (like any good steward of the industry who has been through med-pushing school). "You have the special, genius brain!" She cries, "But seriously think about getting rid of it with some medication." This book made me think that most likely all therapists and psychiatrists are depressed or anxious (their heightened perception of people's emotions is why they became psychiatrists). They are most likely pushing drugs that they themselves take, desperate to help others become more like them, desperate to remove the stigma that it would serve them to remove.... But I can't think rationally about medication because I have watched so many fascinating and interesting friends turn into zombies on the stuff. -Brain difference + high IQ = crazy genius. The high IQ enables the person to find a way to deal with their brain and tap into its strengths. -Brain difference + normal IQ = the people who don't benefit enough from their super powers to value them and just want to be "normal." -Brain difference + low IQ = incapacitated people on permanent disability that drain four billion dollars a year from the country. Anyway, I can't say that Saltz has more to add to the conversation about the connection between genius and insanity than most of the great philosophers (who were all either anxious, depressed, or ADD, or something even more fun). But as I normally read philosophy, it was good to familiarize myself with how the white coats talk about these things. Dr. Saltz writes about various brain disorders including dyslexia, ADD/ADHD, anxiety, depression, bipolar disorder, schizophrenia, and autism, focusing on how various people with these disorders can use the gifts that come with them to their advantage. Her conclusion is pretty straightforward: People whose brains are mildly ill are often more gifted than those whose brains are normal or those with severe illness. The key is early intervention and treatment, as well as greater acceptance from soci Dr. Saltz writes about various brain disorders including dyslexia, ADD/ADHD, anxiety, depression, bipolar disorder, schizophrenia, and autism, focusing on how various people with these disorders can use the gifts that come with them to their advantage. Her conclusion is pretty straightforward: People whose brains are mildly ill are often more gifted than those whose brains are normal or those with severe illness. The key is early intervention and treatment, as well as greater acceptance from society. This is all quite interesting to me because I have a mother with traumatic brain injury, a brother-in-law with schizophrenia, a husband with undiagnosed ADD and dyslexia, and I myself suffer from anxiety, depression, and maybe some kind of mild asperger's; I'm not sure. I think it's an important message to people who struggle that everyone has their strengths and that the weaknesses aren't anything to be afraid of; just something to treat carefully. I have a tendency to be obsessively organized. It bothers me when things are out of place. I don't know that it's necessarily an illness, but I do like to have control over my environment. I used to see this as a flaw, until I had a counselor who told me that even if I didn't develop this for a great reason, I can now use it to my advantage. That was the first time someone had told me that something I regarded as a terrible flaw could be a benefit. Now, this book drives the point home. Anxiety? If you can get it treated, you can use your perfectionistic tendencies to do great work. Depression? Sometimes you may be more creative than others and also have greater empathy for those who suffer as well. It is an important point that people with mental illnesses might struggle less if society were more knowledgeable and accepting. The stigma sometimes causes people to refuse or delay treatment not only for themselves, but for their children. In America and other individualistic societies, people's auditory psychotic symptoms can even be worse than in more group-oriented societies (a Stanford researcher discovered this when comparing American people with schizophrenia to those in India and Ghana). Anyway... good book for anyone to learn more about people who live with mental illnesses and what they are ultimately capable of. ...and if you might have a brain disorder, please get evaluated. There is nothing glamorous about trying to treat yourself with alcohol or drugs, or to push through it by yourself. If you're a person of faith, faith might help you cope, but it's not always going to fix you, and that is not your fault. The author, a psychiatrist and professor, discusses well-known mental conditions and how they can be a double-edged sword - disruptive and often destructive, yet filled with potential for creative and spiritual achievement. Each chapter is dedicated to a specific disorder -- e.g. bipolar, autism, schizophrenia -- and noted individuals who have learned to manage their disorders while utilizing the positive aspects to attain great heights in the arts and sciences. She does not sugarcoat each disor The author, a psychiatrist and professor, discusses well-known mental conditions and how they can be a double-edged sword - disruptive and often destructive, yet filled with potential for creative and spiritual achievement. Each chapter is dedicated to a specific disorder -- e.g. bipolar, autism, schizophrenia -- and noted individuals who have learned to manage their disorders while utilizing the positive aspects to attain great heights in the arts and sciences. She does not sugarcoat each disorder. The majority of sufferers are not brilliant or gifted, and many experience crippling pain and societal ills -- i.e. homelessness, divorce, suicide. However, those who possess a certain intelligence seem better able to identify and control their behavior, as well as develop adaptive techniques to harness their usually intense psychic energy. Someone with ADHD, for example, may be able to focus intensely on a project. Those who are bipolar, while needing lithium to maintain balance, can channel their euphoria into works of art. Apparently IQ is the bottom line for success. Interestingly, her advice on educational methodology for those with autism was something I felt I could have written, had I had her credentials. According to her, autistics can be taught "80-20" -- 80 percent of subject matter in which the autistic have a passion and talent; the other 20 percent will go toward strengthening weaker areas. This should apply to a number of special needs students. She views mental illness as simply a part of the person, like red hair, but not a totally defining characteristic. By recognizing symptoms, people can separate their disorder from the rest of their personality and lead productive lives. The author's approach to mental illness may be at odds with the Orthodox Jewish community, who unfortunately feels too pressured by stigma to create appropriate outlets for self-expression. In a society where conformity is the highest moral ideal, the wildly creative will feel squelched. Beethoven might have applied his manic energy into composing magnificent symphonies, but these have little value in a world where rigidity and extreme studiousness is preferred. Sadly, too, women who suffer mental disorders will have particularly difficulty, since modesty to the point of invisibility is the norm, along with "ladylike" behavior. It's easy to forget how uniquely we each experience this thing called life. I often think of Pessoa's reminder, "it's the central error of the literary imagination to suppose that others are like us and must feel as we do. Fortunately for Humanity, each man is just who he is, it being given only to the genius to be a few others as well." In The Power of Different, Dr. Gail Saltz explores how brain differences often correlate to unique genius. "Hallowell's particular talent, which he directly attr It's easy to forget how uniquely we each experience this thing called life. I often think of Pessoa's reminder, "it's the central error of the literary imagination to suppose that others are like us and must feel as we do. Fortunately for Humanity, each man is just who he is, it being given only to the genius to be a few others as well." In The Power of Different, Dr. Gail Saltz explores how brain differences often correlate to unique genius. "Hallowell's particular talent, which he directly attributes to ADD and dyslexia, is a “sixth sense and ability to see through people." I read people in a way that is almost a liability. Hypocrisy I can spot a mile away, and I can always see the phony ulterior motive.” This intuitiveness is exceptionally acute, and he notes that he shares it with others who have been similarly diagnosed. “What we [with ADD and dyslexia] see as obvious is something that others don't see at all. Meanwhile, we struggle with things that they find easy—organizing ourselves, reading quickly. They think we should just get our acts together. But we say, it's not that easy. I found this book to be insightful. Gail Saltz, a psychiatrist, probes the link between mental illness, learning disabilities, and genius; take for example the connection between autism and savant ability. Saltz admits that with all brain differences or disorders the most extreme symptoms would likely overwhelm any inherent strengths. She begins by asking several questions. The Power of Different is a diverse literature that focuses on the topic of mental disabilities that affect the lives of several individuals but also looks at the greater potential of talent these individuals have because of their disability. This book works to redefine the stigma that is associated with many common mental disorders including ADHD, Bipolar Disorder, Anxiety, Autism, Schizophrenia, and more. Instead of looking at these dilemmas as disabilities she labels them as ‘brain difference The Power of Different is a diverse literature that focuses on the topic of mental disabilities that affect the lives of several individuals but also looks at the greater potential of talent these individuals have because of their disability. This book works to redefine the stigma that is associated with many common mental disorders including ADHD, Bipolar Disorder, Anxiety, Autism, Schizophrenia, and more. Instead of looking at these dilemmas as disabilities she labels them as ‘brain differences’ in the hopes of looking at the differences in a different way. She emphasizes the importance of shaping education to fit individual students’ learning needs and straying away from holding students to standards that hold them back form true success. I chose this book because they idea of mental diversity is something that, in my opinion, is overlooked. When people think of diversity they normally first think of ethnic diversity and language diversity, overlooking things like sexual diversity and in this case mental diversity. I chose this book because it is a unique theme within the idea of traditional diverse literature and arguably more important than ever. Readers within the intermediate level will easily connect with this book based on its overarching theme and important message. This piece emphasizes readers to recognize that individuals with brain differences can contribute to our society just as much as anyone else, just simply in different ways. Students in the intermediate age group are discovering life and beginning to explore their own opinions on a whole new, deeper level and The Power of Different would do an amazing job at altering the traditional mindset for anyone that picks it up. This diverse piece of literature does a moving job at sharing with its readers the power of what it is like to be different in our society. Psychiatrist Gail Saltz looks at the larger categories of "brain differences", such as dyslexia, depression and ADD in this interesting audiobook. This is a surface-level look at these brain differences (it comes out to a little more than an hour per difference she discusses - you can't expect any more than surface-level discussion), but informative nonetheless. Considering that the average person probably has no knowledge of any of these differences or, at best, a great deal of knowledge of one or two of the seven she discusses, this book serves as an excellent introduction. Each chapter starts with a description of each of the brain differences including physical differences, if any. Saltz also introduces the reader to two or three high-achieving people with these differences. Some are celebrities, some are not. Then, she lets them describe how they used turned their perceived weakness into a strength. Saltz does not sugarcoat these differences and she is sure emphasize the amount of work that these individuals put in to get to where they are now. Saltz read her audiobook herself. Sometimes authors who read their own books do a less-than-stellar job, but Saltz did a very good job with it. As a teacher, I would recommend this to any general education teacher. Really interesting, well written for any layperson laying out plainly the traits of various brain differences -- both the positives and the negatives of many DSM classifications. From Depression or ADD, Hyperactivity or Dyslexia, the author focuses on the things those brains excel at -- where they have superior skills and give examples of high achieving individuals with those diagnosis as well as discussing methods for overcoming some of the functions that are hindering them. The fact that the la Really interesting, well written for any layperson laying out plainly the traits of various brain differences -- both the positives and the negatives of many DSM classifications. From Depression or ADD, Hyperactivity or Dyslexia, the author focuses on the things those brains excel at -- where they have superior skills and give examples of high achieving individuals with those diagnosis as well as discussing methods for overcoming some of the functions that are hindering them. The fact that the latest brain research shows that no two brain are alike, that genetics play a role but environment seems to have the bigger impact on the imprinting of neural networks and even those whose brains work differently have unique and important abilities. A function such as facial recognition that can be impaired in one brain can also detect patterns that a normal person can not see...and the importance of all of this on our current emphasis in education of standardized testing is leaving a HUGE per centage of students in the margins and destroying their creativity and effectiveness in society. If you've ever felt that your or someone you love's brain is a little bit different, this is a great book and an excellent review of the different brain differences that can bring both despair and unique super-abilities. The author covers in detail the six main mental and brain differences that can cause developmental issues in both children and adults, all of which come with their own stigmas and problems. The six are: Dyslexia, Attention Deficit Disorder, Anxiety, Depression, Bipolar disorde If you've ever felt that your or someone you love's brain is a little bit different, this is a great book and an excellent review of the different brain differences that can bring both despair and unique super-abilities. The author covers in detail the six main mental and brain differences that can cause developmental issues in both children and adults, all of which come with their own stigmas and problems. The six are: Dyslexia, Attention Deficit Disorder, Anxiety, Depression, Bipolar disorder, Schizophrenia, and Autism. The book covers each disorder in its own chapter, complete with real-life examples of people who have dealt with it, and the strengths they discovered. The book shows how each disorder makes a person different, and hones in on the unique abilities and strengths that disorder can provide given the proper treatment. Most of our most trans-formative leaders and most talented authors and artists have had to deal with one of these six disorders, and in many cases it is because of these differences that they were able to provide a unique stimulus to mankind and history. Labels. We all use them to describe different things, objects and unfortunately people. In Dr. Gail Saltz's book, she examines the underlying principle that labels aren't necessary. In this case, brain disorders or as she referred to them as brain differences. Interviewing everyday people or those of fame such as Anne Rice and David Sadaris and examine the lives of Einstein, Beethoven and Darwin, among others, Saltz teaches us the power of strength vs weakness and how brain differences can be th Labels. We all use them to describe different things, objects and unfortunately people. Interviewing everyday people or those of fame such as Anne Rice and David Sadaris and examine the lives of Einstein, Beethoven and Darwin, among others, Saltz teaches us the power of strength vs weakness and how brain differences can be the strength to create. Learning Differences- Dyslexia; Distractibilty- ADD, ADHD; Anxiety-Obsessive Compulsive, Panic and Phobias; Melancholy-Depression; Cycling Mood- Bipolar Disorder; Divergent Thinking- Schizophrenia and Relatedness- Autism; are all subject matters of brain differences. When several were asked if one could rid themselves of their brain differences, would they? Their answer may surprise you. "My (high) school has a bunch of weird students, which is great for me. There's very little judgment. Almost my entire school is this quirky cast" -Ethan. Gail brings attention to the positive aspects of mental disorders such as dyslexia, ADD/ADHD, anxiety, depression, bipolar disorder, schizophrenia, and autism, Asperger and those afflicted. I liked the collection of examples of peoples who became successful despite having a mental disorder. I enjoyed the discussion about depression or ADD, Hyperactivity or Dyslexia, where author focuses as an opportunity where may brains excel (when people overcome the situation, actually). This is a second autho Gail brings attention to the positive aspects of mental disorders such as dyslexia, ADD/ADHD, anxiety, depression, bipolar disorder, schizophrenia, and autism, Asperger and those afflicted. I liked the collection of examples of peoples who became successful despite having a mental disorder. I enjoyed the discussion about depression or ADD, Hyperactivity or Dyslexia, where author focuses as an opportunity where may brains excel (when people overcome the situation, actually). This is a second author who I read in post 6 months which relate depression to many failed social aspect and also body activity. I find myself in some arguments about daydreamers and the amount employment required to learn some subjects. As for ones it is natural and easy to learn, for others like me we need to work a lot more but it doesn't mean we're slow. Best case are the ones which may find the situation as an opportunity to excel achieve much more than those people with no such hardness to learn. I wish I would read this before.